Held every two years, Haulage & Loading is the conference for surface mining professionals. The event, which brings mine operators and suppliers together in an informal Arizona resort setting, focuses on improving surface mining operations in general and truck-shovel loading in particular. The technical program offers continuing education for mining engineers and mine managers. This exhibitor prospectus explains how suppliers can use the exhibit and sponsorship program to put their names and ideas in front of those mining professionals. Mining Media International, the company that publishes Engineering & Mining Journal (E&MJ) and Coal Age, purchased the Haulage & Loading conference from SEMCO Publishing in June 2017 and immediately began to make improvements. One of those improvements was the decision to host the event in March at the Hilton El Conquistador Resort in Tucson. It’s an affordable venue ($169/night) that meets the conference’s needs. In addition, Mining Media International recruited Dr. Tim Joseph, the engineering associate dean at the University of Alberta, to improve the technical program. A popular past speaker, Dr. Joseph offers delegates practical ideas they can immediately implement at the mine to improve operations. He is currently reaching out to mine operators, contractors and others to build a timely educational program. The exhibit and the sponsorship packages for Haulage & Loading 2019 have been reorganized in a way to suit both large and small suppliers. The conference is now the central focus of the floor plan, which offers a more inclusive format. A host of social activities are also planned to allow participants to network. The Hilton El Conquistador is a family-friendly resort with a spa and on-site daycare. Two off-site outings have been organized during the sessions for spouses, significant others and family members. 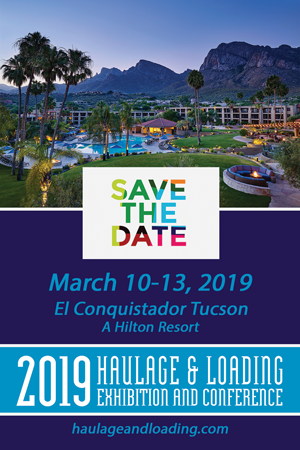 Please consider joining us at the Hilton El Conquistador for Haulage & Loading 2019.